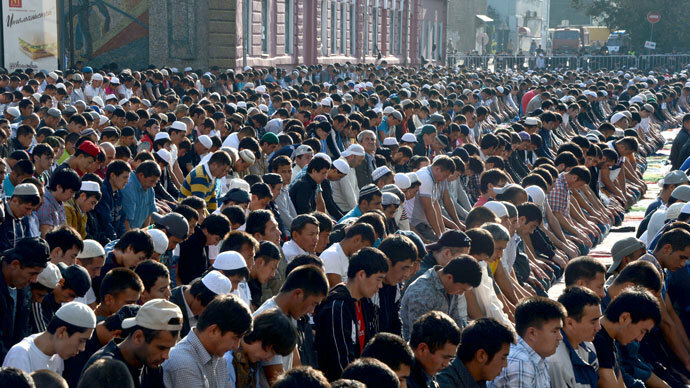 Moscow authorities are considering a plan to put about 100 prayer grounds in city parks in order to tackle the shortage of mosques brought on by the massive influx of migrants from Muslim countries. The proposed prayer places could serve as a temporary solution for a city whose official population stands at nearly 12 million yet only has four mosques – one of which is closed for repairs – the authors of the project, who refer to themselves as a “group of urbanists”, told Izvestia daily. In comparison, London has 100 mosques for 8.3 million people, Beijing has 70 for 17 million residents and New York City has 140 for 8.5 million, said the main promoter of the project, Tigran Arutunyan. In accordance with the plan, special places of prayer would be set aside in city parks for Muslims, making them both accessible for worshippers while also being far away from residential areas. In addition, the urbanists suggested making the necessary installations collapsible so that they are only assembled for times of the prayer. They would subsequently be decorated with special prayer carpets that worshippers would bring along themselves. During major religious holidays, the areas could be equipped with a projection screen broadcasting the address of the Imam in the Russia’s capital’s main mosque, located in downtown Moscow. A senior official of the Spiritual Department of Muslims of European Russia has said that their organization was aware of the plan and was discussing it. Yelena Tkach, a deputy at a municipal legislature in one of Moscow’s districts, opposes the idea, however, saying that city parks should be used for recreation and not for religious services. 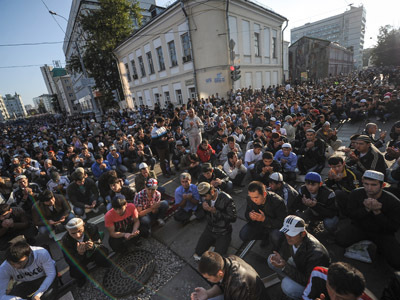 The mosque shortage issue in Moscow once again became apparent last week after about 160,000 people gathered to celebrate the end of the Ramadan fast – the holiday of Uraza-Bairam. Although 10,000 less worshipers came out this year than in 2012, authorities were nonetheless forced to set up dedicated grounds in several parks and stadiums to accommodate everyone. In 2012 politicians, spiritual leaders and rights activists furiously debated a proposed plan to build more mosques in Moscow. Representatives from Russia’s Muslim community argued that in the absence of officially sanctioned places of worship, adherents could easily fall under the sway of extremists. 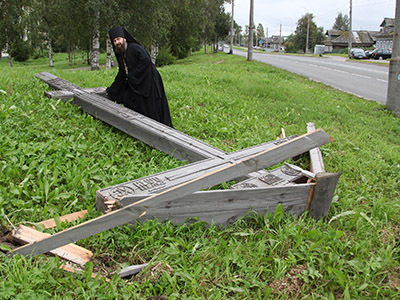 Russian nationalists bluntly opposed the plan, saying that migrant workers should leave Russia upon completing their work and there was no need to accommodate their religious needs. Moscow Mayor Sergey Sobyanin ultimately announced that there were no plans for the construction of new mosques, adding that the 'excessive' number of economic migrants was a ‘harmful thing’.